A new World Championship will be declared in a few days and it will come down to two players. Former champion Antoaneta Stefanova of Bulgaria faces the Ukraine’s Anna Ushenina for the crown to culminate two weeks of bruising chess battles. The winner will have to face Hou Yifan in a match next year. 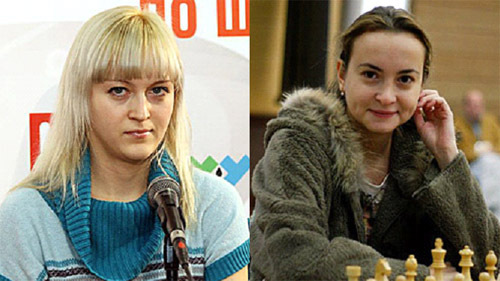 Stefanova was champion in 2004-2006 while Ushenina is a perennial star for the Ukraine side. The first game in the final of the Women’s World Chess Championship ended in a draw with Antoaneta Stefanova pressing for the win. In a bit of time pressure, the Bulgarian erred and allowed counterplay. Anna Ushenina was able to salvage a half-point. An uneventful draw today in the Women’s Championship keeps the score knotted even. The seventeen-move draw had the makings of a struggle, but the tension was relieved quickly. After 17…Bb7, black would have enough compensation for the pawn. Anna Ushenina won in crushing fashion today and is +1 with one to go. Stefanova will press with white tomorrow. Ushenina moved to the brink of a World Championship with a rousing win in game three. The game was actually a crush after Stefanova seem to lose the thread of the position after 14…f5 15.Qb3 e5!? The Ukrainian pounced quickly after after 16.Ng5 exd4 17.Nxd5! giving two pieces for a rook but with a strong initiative. Ushenina maintained the pressure, broke through on the queenside and reclaimed some material. The strong passed c-pawn would keep the defense occupied while white was conjuring up an attack on the exposed king. Stefanova resigned in a hopeless position. The former champion will try to equalize in the last classical game before tiebreaks. Antoaneta Stefanova equalized the match with a blistering attack against a Anna Ushenina today forcing a tiebreak situation. Ushenina needed to hold a draw to become World Champion, but a devastating loss on the brink could be quite a blow to her psyche. Stefanova played with confidence and built up a strong position while Ushenina played passively and she quickly spiraled into deep trouble. At the moment of 21.Bf1, Alexander Khalifman stated that black was in a technical losing position. Stefanova proved him right by drilling through black’s frail position with 26.Nh6+! gxh6 27.Qxf6 Qf8 28.Nf5. However, Stefanova erred with 30.Nd6?! when 30.Ng3! was more convincing. After missing a chance to get back in the game with 30…Ba8! Black started flailing to salvage the position with 31…Bb1? but white finished curtly with 32.Nxf7! Rxd2 33.Nxh6+ when black is mated on the board. Anna Ushenina wins World Championship! 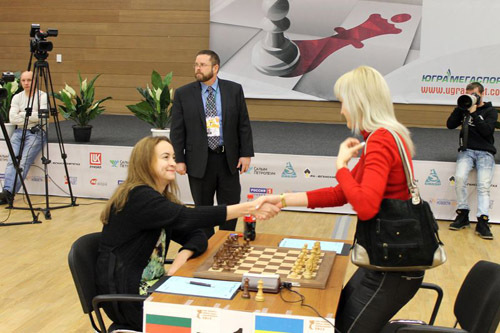 Anna Ushenina of the Ukraine won the final in the Women’s World Chess Championship by beating Antoaneta Stefanova of Bulgaria 1½-½ in rapids. The first game was a hard-fought 89- move draw with Stefanova pressing. Ushenina was able to hold in a double bishop ending. In the second game Stefanova fell into passivity and allowed the Ukrainian to win control of the position. Black’s passive pieces along with poor pawn structure and exposed king were too much to repair. Ushenina exploited the advantage careful an ended up two connected pawns up and the rest was academic. Ushenina will play Hou Yifan in a World Championship match in 2013. Maybe so, but so many blunders!! Sheesh. A beautiful place for the tourney but the terrible weather played havoc and has claimed many really legit contenders. Much as I liked it, Anna Ushenina is great but unfortunately she has been helped tremendously by the weather so that the strongest players were forced aside with some of them catching cold and performing below par. This leaves recognition of her as the real world champion with some shade of doubt. It’s a pity that the result of a World Championship was so random caused by a 1 off day performance of some players. It is so strange that in order to produce just a challenger to the World Champion FIDE needs so many rounds of Grand Prix to decide whereas the one deciding the World Champion itself in the knockout system is so brief and only need to based on just 2 games most of the time! It’s so ironical! Therefore the result could only be so random!!! I don’t like that the championship is decided this way. It should be a qualifier. You are spot on Daaim. I am not rooted for Hou Yifan though she is really solid. I am a fan of others as well, such as Kateryna Lahno etc. The importance FIDE placed on WWCC title using knockout system leaves much to be desired. It cheapens the title to the level of almost any other ordinary tournament. And, as I mentioned above it just did not make sense to me that FIDE took great pride and hard work just to produce a challenger then a lottery way to produce the WWCC title. This way FIDE could not prevent wild card result which might not truthfully represent true strength. This should be a World Cup instead of World Championship.